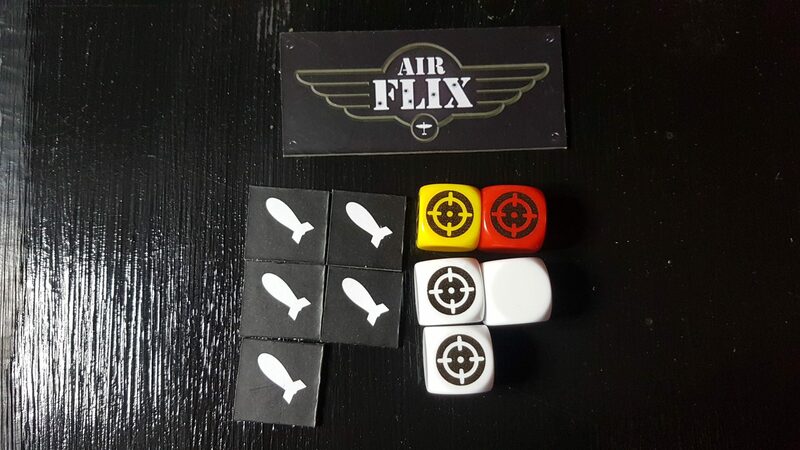 Coming to Kickstarter very soon is Air Flix, the latest game from Dice Sports the company behind one of my favourite solo games – Z War One. When the guy behind the project asked me to have a look I was a bit skeptical as there are no zombies, but Z War One was done well enough to make me cast my doubt aside and give Air Flix a shot. Let’s dive right in. The box art looks great, this has absolutely zero to do with the game but its the first thing you see, so good artwork is a good first impression. Air Flix is designed for 2 or more players aged 14 or older and is designed to last around the half an hour mark. I’ll be testing with a seven year old so wish me luck. Bearing in mind the copy I have is pre-production, I have to say that although the game is pretty much ready, there is a chance that some things might change. I wouldn’t have thought the core mechanics will change that much, though. Upon opening the box I was confronted by a rather large playmat, measuring in at three by three it’s not overly massive but it is quite a thick mat to play on. The details on the play side are quite crisp and the markings to play the game are easy enough to see without overpowering the actual background image. The image itself is a rather pretty coastal scene. Could we possibly see a city ‘blitz’ style mat? I don’t know but that would certainly allow some cool rules such as night fighting and bombing runs. 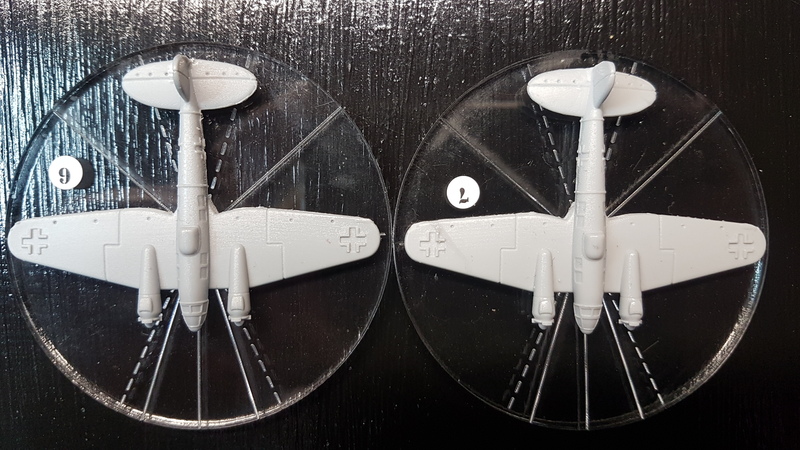 To fly over the mats I was provided with 5 submarine spitfires (guess who is going to be googling camo schemes later), 5 Messerschmidt and 2 Hienkel 111 bombers. As you can see below these are small models and to get them painted to look great is going to be way beyond my skill sets. 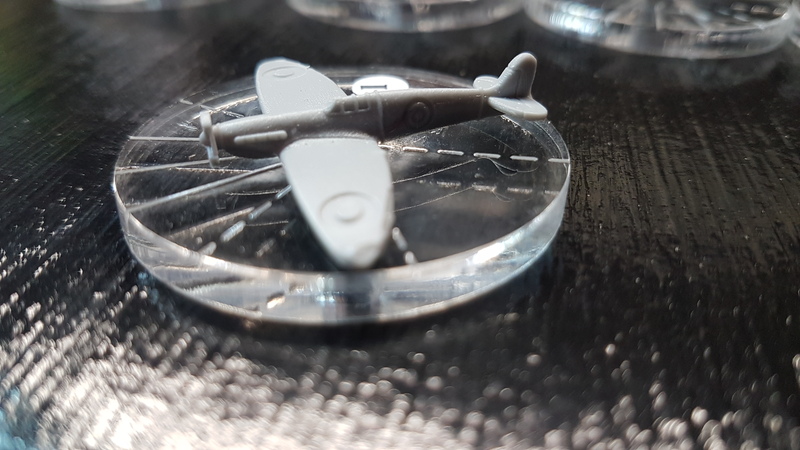 Even though they are small there are still some great details on the mounds which will help make the painting a bit easier, such as the Luftwaffe and Royal Airforce Symbols. To play the game you are going to need more than a mat and models, so for that we have a bundle of accessories. Custom dice in three colours, two range rulers, some bomb tokens and more importantly dashboards for the players. Not forgetting the cards needed to represent the planes, of course. Central to the game mechanics are the dashboards. 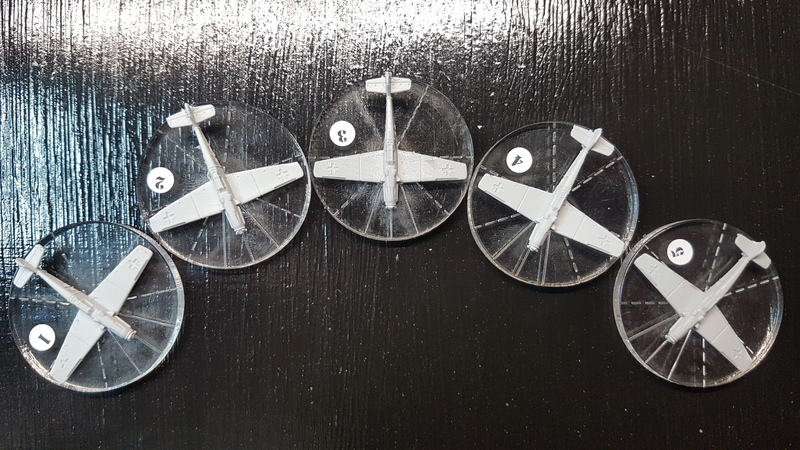 These are used to keep track of your squads and pilots, at the moment my planes are numbered but hopefully I can find some cool call signs to paint on. At its simplest Airflix is kind off like Subutteo with bombs and machine guns. Although, I have heard someone describe it as snooker in the skies. You flick your models around the tabletop mat, turn them and try and shoot your opponents planes out of the sky. However, as simple as it sounds it doesn’t mean it’s easy. The skies can get pretty crowded and midair collisions are not a good idea. The player making the colliding move is pretty much always going to come off worse. Not only that but the mat is marked with hexes that determine how you can move. 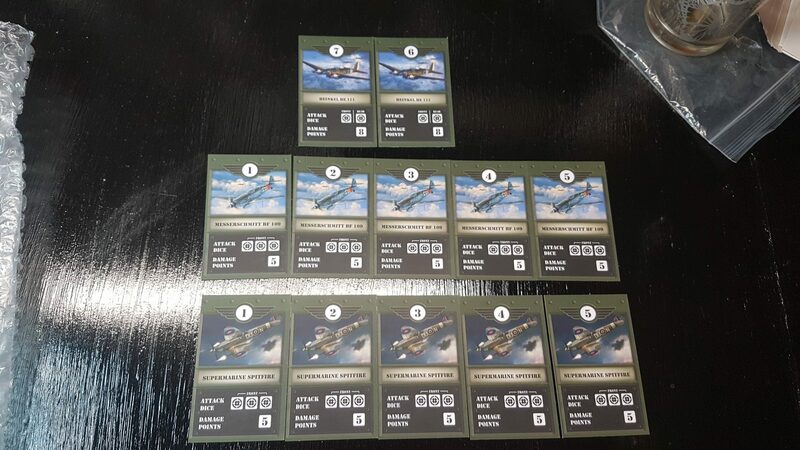 Each player has cards that give information on the pilots, which are represented on the dashboards. The cards denote the amount of health and the amount damage that planes can dish out. Spoiler alert! There are more cards coming in the form of Ace Pilots, which will be part of the Kickstarter campaign. Hopefully some will feature really cool, special rules which will add a lot more flavour to the game. I mean, they are aces after all! I’m hoping for some immense, exciting dog fights to be on the horizon. At the moment the rules I have seen are very simple and straight-forward to follow whilst providing depth to handle with different scenarios. These include the aforementioned mid-air collisions. Shooting in Air Flix is a relatively straight forward affair, you line up your shot and calculate the dice pool. For a change, working out the dice pool is an easy prospect in this game. Air Flix is fast and incredibly brutal, there is no defence from an incoming barrage of machine guns rounds. If your opponent manages to manoeuvre in behind you, your best hope is that he rolls dice as well as I do. Else, there’s a good chance you are going to lose a plane. Currently there are two game modes. The first is Supremacy which is a straight up-and-at-’em dogfight scenario. 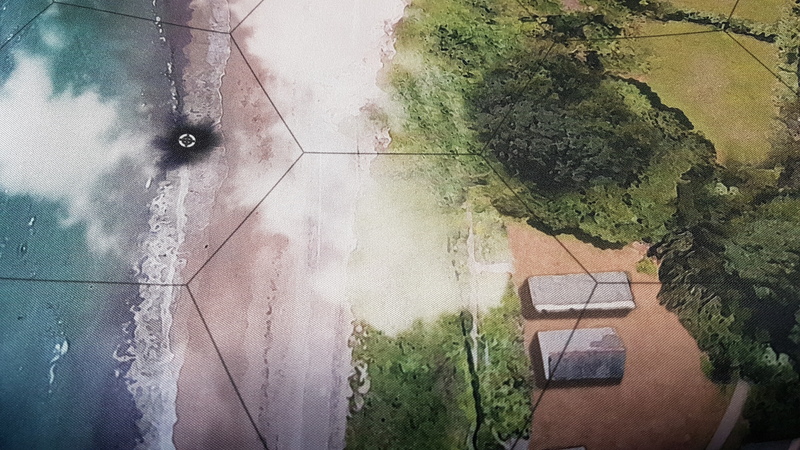 The second is Blitz where the Axis are trying to bomb targets off the map whilst the Allies are trying to shoot down the bombers. I have even heard that there maybe a special token involved in one game mode, a unique take on a very old and familiar game. As mentioned earlier one of the kickstarter goals will be the Aces, pilots with special abilities, a new game mode called Barrage and a unique coin. We’ll provide more on this soon as Air Flix breaks through its Kickstarter goals. The Kickstarter for Air Flix starts on June 5th and Dice Sports have a history of completing to a good standard. We’ll bring you more on this as it comes up but as always, keep checking back to the site and our Facebook page.